Geophysical survey is used to map buried archaeological features. 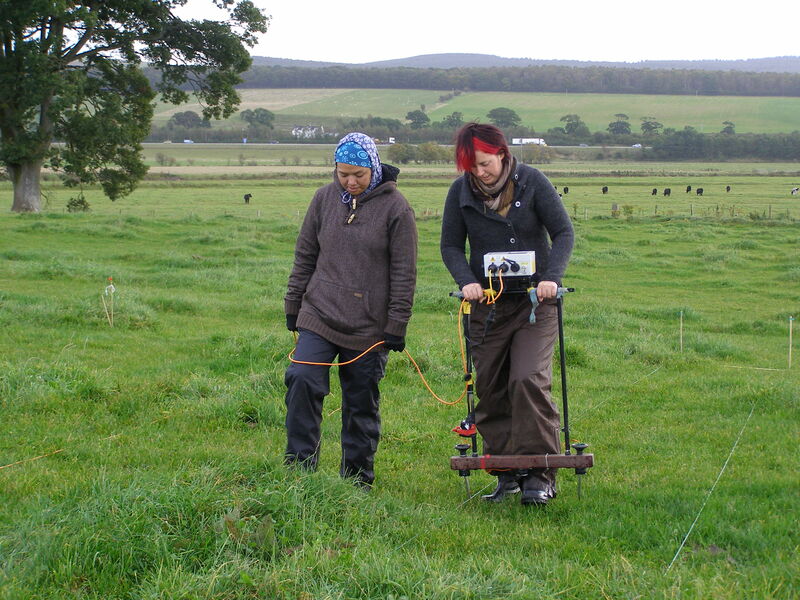 At Lochbrow we are using geophysics to add to what we already know about the archaeology from the cropmarks. 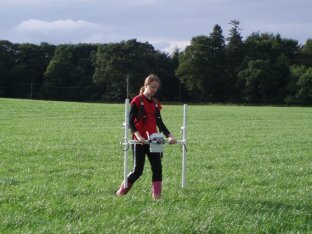 As the formation of cropmarks varies considerably at Lochbrow, unresponsive areas may mask additional features, so geophysics can look into these ‘blank’ areas. Additionally, it may reveal buried features that are either unclear on the aerial photographs or would not create cropmarks, and can provide additional information about the known features. Magnetometry: This technique detects small changes in the earth’s magnetic field, caused by buried features and disturbances in the soil. Iron, brick, burnt soil an d many types of rock, and archaeological features composed of these materials, will produce strong anomalies. Disturbed soils or decayed organic materials will produce more subtle anomalies. Magnetic survey is good for covering large areas relatively quickly, and is the main technique employed by the Lochbrow Landscape Project. We have been using a Bartington Grad 601-2 magnetometer. Resistivity: This technique passes a small electric current through the soil and measures the amount of resistance that results. Electrical resistance in the soil varies and is affected by the level of moisture in the soil. Dryer areas of soil will impede the flow of electricity and so will have a higher resistance; damper areas of soil often conduct electricity more easily than surrounding soils and will show a lower resistance. Buried archaeological features with varying moisture content, such as pits and ditches (often higher moisture content) and stone walls (often lower moisture) will therefore stand out against the soil around them. When patterns of resistance are plotted, it is often possible to identify where ditches, pits or walls exist. For the resistance survey we have been using a Geoscan RM15 twin-probe resistance meter.